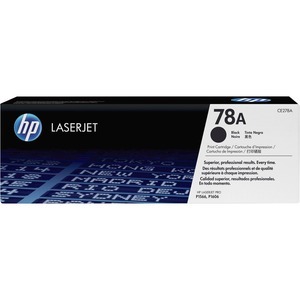 HP 78 LaserJet Toner Cartridges offer great value for everyday business printing. HP LaserJet toner cartridges help you print professional quality reports, letters and invoices with ease. Avoid downtime with the legendary quality and reliability of Original HP LaserJet print cartridges. Produce bold, crisp text and sharp black-and-white images. Use HP LaserJet printers together with Original HP toner cartridges to achieve consistent, professional results. Simplify your printing experience with reliable, easy-to-use printing and supplies management, plus convenient, free recycling.